Belle is a character from the Disney movie called Beauty and the Beast. She is dressed in her original signature dress and rare yellow shoes (almost always lost). 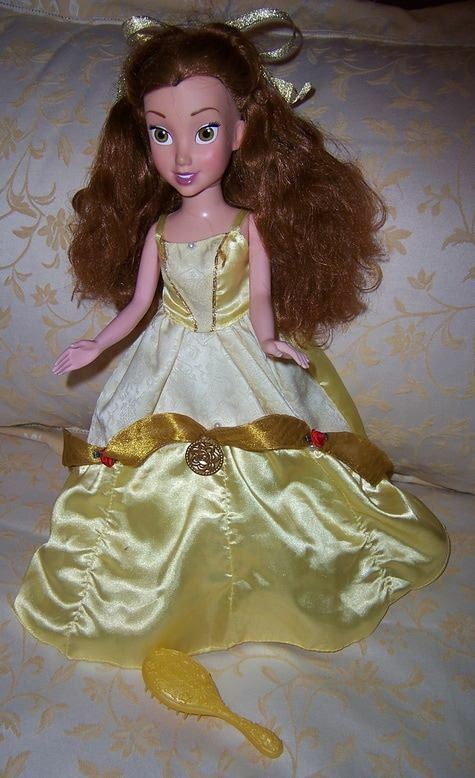 Belle is an all vinyl jointed doll with wonderful large hazel eyes, and gorgeous long brown rooted hair in original style. song from the movie ''Beauty and the Beast'' by pressing a button at the back of her neck. Her knees bend so she will sit on the edge of your bedside table while she sings her song to you as you drop off to sleep. She has painted open hazel eyes, and rooted brown hair. She is wearing her original yellow ball dress with an attached net stiffening petticoat to create fullness. She has an adornment on the dress which can be removed and made into a necklace - see photo. She also has her original clear yellow high heel shoes on her feet. These are usually missing. Belle takes 3 X AAA batteries which will not come with her. She will also come with a yellow plastic hairbrush for her hair. 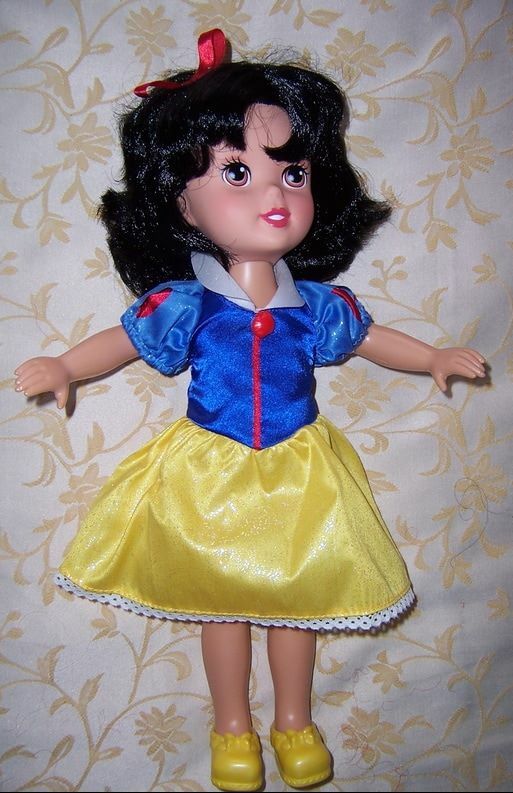 Snow White is a very pretty doll made into a toddler doll body. 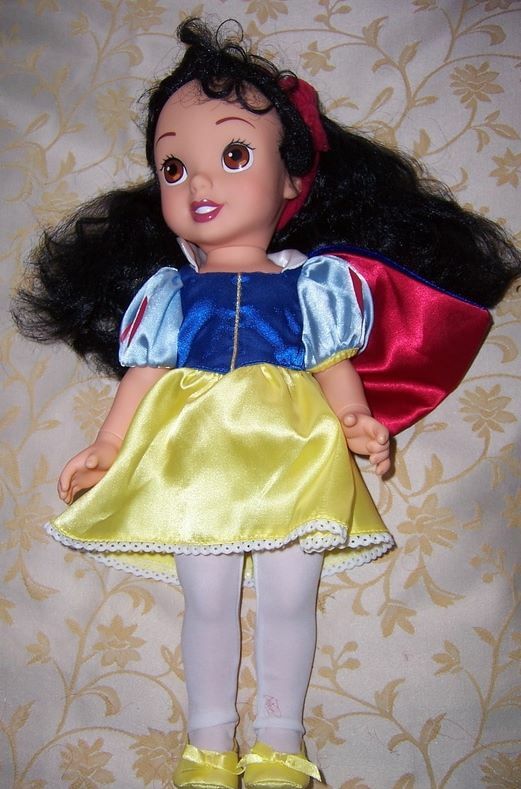 She is wearing her removable original Snow White dress which is sparkly, and her original yellow plastic shoes which are usually lost. She is a very pretty doll with a gorgeous princess dress. She is wearing her removable original Snow White dress and her cape. She also has on white tights and yellow fabric shoes. She is a lovely doll with a gorgeous princess dress. 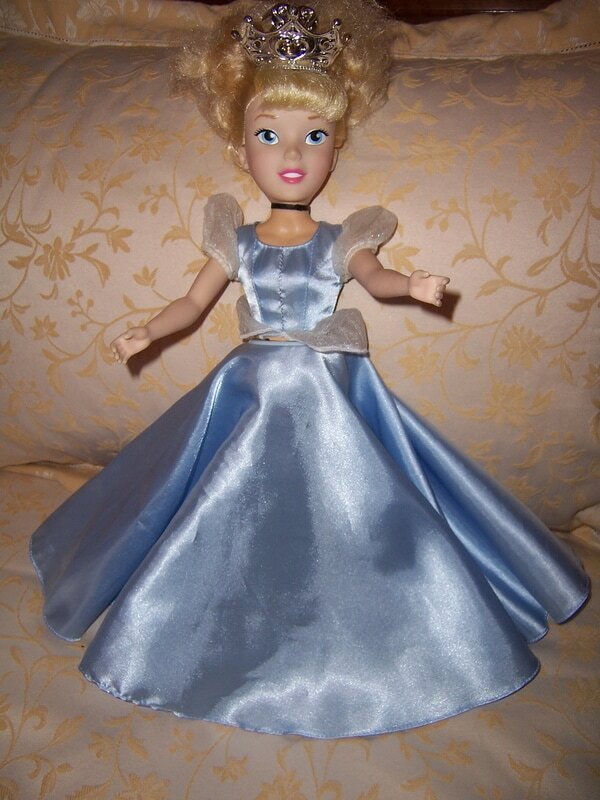 Cinderella is a pretty doll in a pale blue satin full skirt which billows out when she twirls around. When you press Cinderella's pink heart gem in her silver crown you can hear music and watch her spin/dance twirl at the waist. Turn her on her back, press her pink gem in her tiara, and listen to the music. If you want to have her spin around then pull up the pink gem tiara and hold onto it. When the gem is put back onto the head then twirling stops. She does not stand on her own but if you hold her in upright position and feet on the ground she will spin around and her dress twirls out. If you hold her up in the air then her body spins around as well as her dress. We have also given you a hair brush to brush her hair, and a Cinderella 5 badge. Belle takes 3 LR44 batteries in her back which makes her sing (new) and two AA batteries (one in each leg) which make her twirl. (new). CINDERELLA IS A LOVELY DOLL AND VERY HARD TO FIND.